The United States is increasingly dividing into two countries, a Blue America and a Red America. Blue America is becoming a more free country, while Red America increasingly has states which intrude more into the private lives of individuals, and use government to enforce the views of the religious right. Blue America is a more prosperous America, while Red America is more dependent upon money from Blue America, taking in more federal tax dollars than they pay. As much as they hate to admit it, Red American is the America of takers. Now we are seeing yet another division. 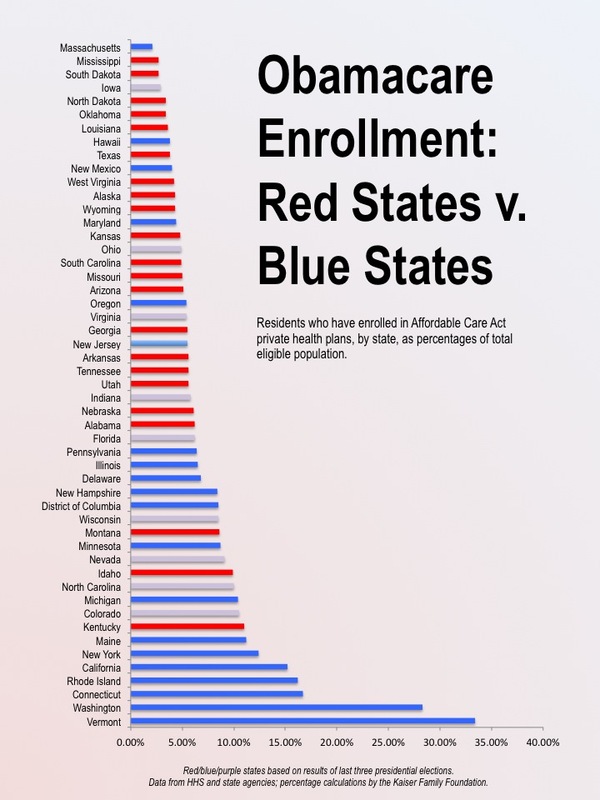 People in Blue America are more likely to receive health care coverage than people in Red America. Jonathan Cohn has two charts which demonstrate this. The first compares people who have enrolled in private health plans through the Affordable Care Act. Note how heavily tilted this is towards the blue states. There are some exceptions. Massachusetts has low enrollment because most people in the state already had health care coverage under their plan. Kentucky is a notable exception of a red state with relatively high enrollment because of having a Democratic governor who has been heavily supporting the Affordable Care Act. There are also some blue states such as Oregon which had difficulties with their state exchange. Enrollment should pick up as this is fixed. There are probably a couple of reasons for this divide. The most significant is probably the degree to which the state governments are supporting and promoting the Affordable Care Act. There is also probably a cultural difference. People in the red states are generally less well informed–if they were not they would not vote Republican. They are more likely to listen to the misinformation about the Affordable Care Act from sources such as Fox. They are also more likely to listen to conservative leaders who are telling them not to purchase ObamaCare coverage. Independent thought is not a strong point among the low-information Republican voters in the red states. The second chart compares expansion of Medicaid. It should come as no surprise that the working poor in the blue states are far more likely to have this available than those in the red states. I can’t help but wonder how long the political leaders in the red states can continue to fool so many of their citizens. Sooner or later they will realize how people with Democratic state governments are benefiting. Some might even decide that it is more important to worry about health insurance than whether two gay guys can marry, or whether women use birth control and possibly even have an abortion.